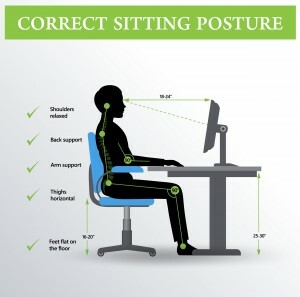 If your work is office or computer based you can spend a significant portion of your day seated at a desk which can lead to host of problems for your health. But with a few changes and addition of good habits, you can keep productive at work and keep healthy. I s your screen is at eye level? If your monitor does not have height adjustment try elevating it with a riser, or even some old books! Increasingly we are working directly off laptops, particularly if you are a mobile or remote worker or hot-desking across offices. However the same rules apply and even more so if you don’t have the luxury of an adjustable chair or monitor. If you are mainly working off a laptop you may want to consider getting wireless keyboards and/or risers so you can optimise your work posture.